I did not take this picture. 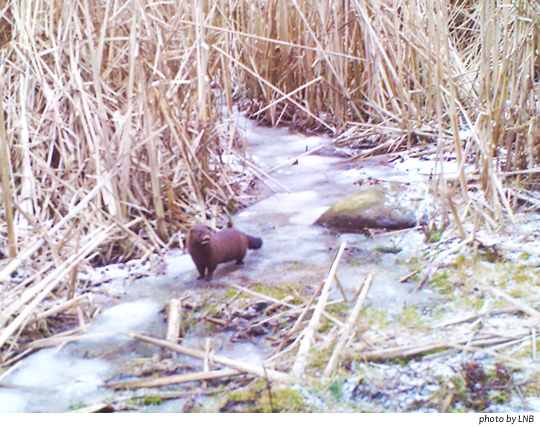 In science news this week, the scientist in our family, who is running a bunch of camera traps around rural upstate New York, came up with this, a snap of an American mink taking the air. I regard this as an amazing photo. It gives you a pretty good look at the distinctive white patch on the mink’s chin. This is the first time I’ve seen a mink in the wild that is not running very fast while carrying some wiggly little prey in its jaws. Mink prefer to be nocturnal, yet here is this fine fellow hanging out in the daylight – given the time of year, very possibly looking for love. I understand that this particular spot is a regular wild animal highway – the same camera trap has revealed masses of possums all marching in line, crowds of blue jays, huge-eyed deer who point their arrogant dumb supermodel faces right at the lens: that’s right, every side is my best side. You know how lovely mink coats look? How soft and glossy the fur is? Those long guard hairs, and then the plush underhairs and the rich mahogany color of the whole. Beautiful fur, and it looks ever so much better on a live mink. This entry was posted in Uncategorized and tagged camera trap, Mink, upstate New York. Bookmark the permalink.